I used a new technique, for me that is, with these Sichuan ribs. 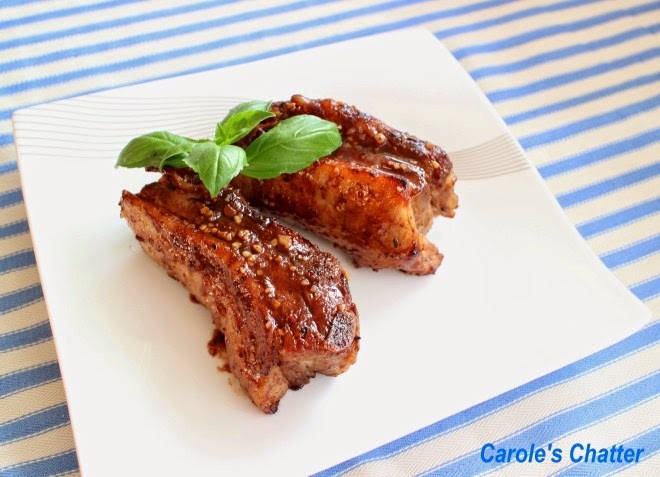 The first thing I did was boil the ribs in water until they were tender – 1 to 1 ½ hours. Take them out of the water and let them cool down. Don't throw the water out – keep it as a base for stock. Don't use all of the marinade at once – use half of it for the overnight marinade and keep the rest for finishing off the next day with the addition of 3 tablespoons of honey and a small amount of sesame oil which you whisk in to the reserved marinade. Paint each rib with the new sauce and then grill them on a high heat for 5 minutes each side. Paint with the sauce again. Serve with lots of napkins – sticky, spicy and delicious! My uncle always boiled his ribs before grilling and I thought they were the best! YUM - love those flavors in the marinade! I usually brown my ribs in the oven before slow cooking them in my slow cooker. Love this boiling/grilling method - we'll have to try that! I like your technique in these ribs for a couplel of reasons. I like that I'm starting tomorrow's dinner the night before, for one. I'll bet the ribs are much more tender and moist than the old way. I can't wait to give this a try. I've never cooked ribs before. Thanks for the tip on boiling first. I also like that you keep the liquid for stock.